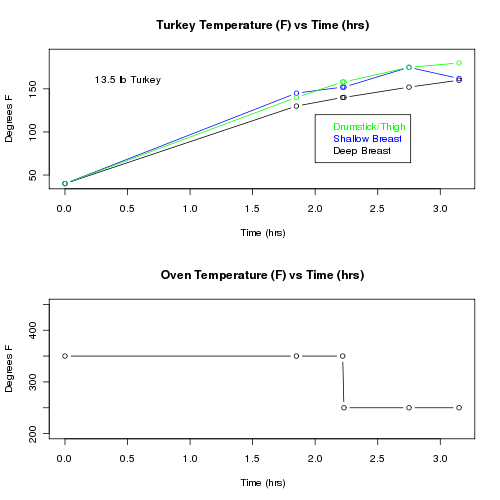 This is a basic summary of the temperature dynamics of our turkey. All measurements are approximate. Also the oven temperature should but doesn't reflect the transient dynamics both initially (when it started at 450) and during the change at about 2.25 hours. The turkey came out very tender. It sat for about 0.5 hours after this insulated under towals during which time the whole turkey equilibriated to 165 F. I think for safety I would recommend a slightly higher temperature when removing from the oven so that the equilibrium is achieved a little more reliably. The dark meat was sliced off and microwaved for a minute or two before serving due to slightly red color of the juices. This is certainly a good starting point for a model, but we need at least 1 chicken and one maybe 25 lb turkey to get a sense of the importance of scale before fitting a reliable model.